Matthew Ordaz is a spirited young man who loves music in any form. 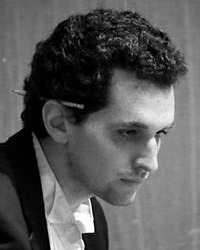 He began composing for piano at age five and has since won several awards in the MTAC Composition Contest and now in the Guild's International Composition Contest. Although he has earned a first place trophy at SYMF for piano performance and four 10-piece Founder plaques, his heart leads him to his drum set much of the time. He also loves to sing and perform on stage any chance he gets, singing with a men's barbershop chorus and with various musical theatre productions. When not playing music, Matthew loves to read, work puzzles, play with friends, and explore nature, science and Star Wars! He is home-schooled with Lighthouse Christian Academy in La Mirada, CA.